The cost of a gallon of gasoline slipped upward about two cents per gallon during the past week, according to the latest weekly survey from the U.S. Energy Information Administration. The U.S. average cost of a gallon of regular unleaded is $3.69, as retail gas prices gave up a three-week respite and continued what has been a steady series of increases since the second week of February. Although prices did take a breather at the beginning of May, falling two consecutive weeks, those price declines were caused largely by significant price volatility in the Midwest, where the cost of fuel rises and falls in major swings from week to week. In fact, it is the Midwest’s almost notorious volatility that has contributed to this week’s U.S. average price hike, with Ohio leading way. Drivers in the Buckeye State suffered a 6¢ per gallon leap in gas prices. At the local level, prices in Cleveland hopped up about 10¢ per gallon. In Chicago, prices jumped a heart-stopping 14¢ to push their way past the $4.00 threshold. 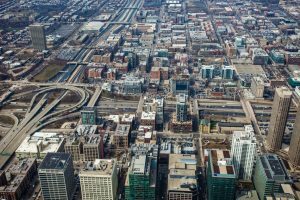 In fact, prices in Chicago average $4.06 per gallon, although that is not the highest rate in the nation. Los Angeles is among the cities that shares the dubious distinction of gas prices over the 4-dollar mark, with the average driver in the city of angels paying about $4.18 per gallon. Drivers in Chicago suffered a 14¢ hike in the average price of gas, as unleaded hit $4.06 per gallon. Region to region, the price of gas is spinning on an axis of uncertainty, with the cost of driving holding steady across a large swatch of the Eastern seaboard. The cost of fuel in New England remains around $3.73 per gallon this week, and prices across the Mid-Atlantic region held steady at $3.70. In the Lower Atlantic, the cost of gas dipped by about 2¢. However, prices in the Rocky Mountain states and along the Gulf Coast were facing pressure to begin a fresh round of cost increases; on the West Coast, most drivers are paying about two-cents more this week than they were last week. 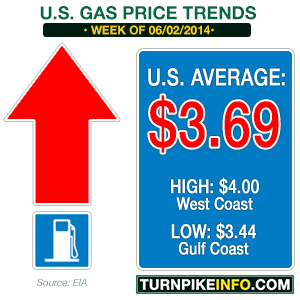 The increase in gas prices comes on the heels of renewed increase in the crude oil futures prices. Prices in early May declined slightly as West Texas Intermediate began to fall below $100 per barrel, but the bid on futures contracts quickly reversed. WTI peaked May 23 at $104.39. After-hours WTI prices were trading at $102.54 Monday night, and Bloomberg News was reporting earlier in the day that traders are watching inventories closely before making any buying or selling decisions. In fact, trading volume was about 60 percent below the 100-day trading average, meaning investors are waiting on the sidelines for new inventory and refinery stock reports. The EIA issues such reports on a weekly basis. Meanwhile, the cost of operating a tractor-trailer rig, at least where fuel is concerned, remained nearly the same this week. Prices have been slipping down in tiny fractions for the past several weeks, and the national average of a gallon of diesel is now about $3.92. That is down about 10¢ per gallon since prices peaked on February 24. However, there are plenty of areas where the cost of diesel is still well above $4.00 per gallon, including California, New England and the Central Atlantic regions. On the East Coast, truckers from Maryland to Maine were paying an average of $4.12 per gallon, while the price in California was about $4.10.